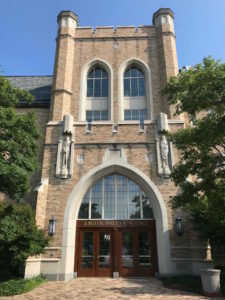 The 25th Biennial Conference on Chemical Education was held from July 29th through August 2, 2018 on the beautiful campus of the University of Notre Dame in South Bend, Indiana. The Biennial Conference on Chemical Education (BCCE) is a national meeting sponsored by the Division of Chemical Education of the American Chemical Society. The conference is designed for middle school science teachers, secondary school chemistry teachers, graduate students, and college chemistry faculty. All chemistry educators were invited to share what worked in their classrooms by submitting a workshop proposal, a symposium topic, or abstracts for presentations. 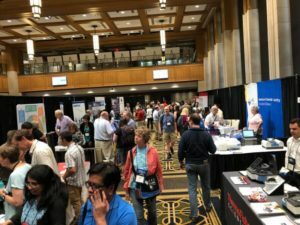 The BCCE conference provided chemistry educators from all across the country with opportunities for interacting with colleagues at all levels in both formal and informal settings. There was a mixture of plenary lectures, symposia, workshops, chemical demonstrations, poster sessions, exhibits and tours of chemistry research areas. Instructors who were new to chemistry education as well as those who have years of teaching experience found this conference to be an excellent source of materials, techniques, and chemistry content. The BCCE provided many research proven practices in teaching and learning chemistry as well as presenting new and innovate activities or labs that would serve to recharge the chemistry classroom. Some of the symposia that I attended included topics such as “Communicating Chemistry via Social Media”, “Models and Modeling in Introductory Chemistry”, “More Bang for Your Buck: More Effective Active Learning Methods in General Chemistry”, “Student-Centered Inquiry Learning with an Emphasis on Process Skills in the Classroom and Laboratory”, “Views from the Classrooms of Award Winning Chemistry Teachers”, “Using Manipulatives in a Chemistry Classroom”, “Teaching Nuggets for AP and General Chemistry”, “The POGIL Project”, and “Green Chemistry in High School, College and University Curricula”. This is only a very brief sample of what was available, and there were even more symposia options for chemistry graduate students and college-level educators. Using the Electron Configuration Lab to build, visualize and make connections between electron configurations of the elements and the 3-D shapes of atomic orbitals. Visualizing the atomic theory timelines with interactive representations of the proposed atomic models. Examining the Kinetic Theory of Gases. 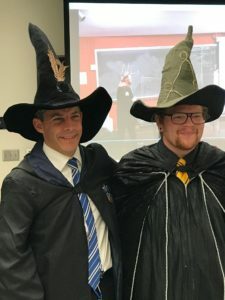 In the “Chemical Outreach Workshop”, a Harry Potter Potions theme was presented in a way that would serve to excite children of all ages and adults in order to introduce essential chemical and physical concepts in a dynamic and safe atmosphere. The presenters guided us through the process of designing our own outreach activity for various types of audiences and provided us with examples of noteworthy demonstrations that we could incorporate into our program. I am currently planning on developing this as a project for my IB Chemistry students and it will be presented as a chemistry demonstration exhibit for younger students and/or parents in order to get students more engaged in the study of chemistry. If it is successful, the outreach activity could possibly be expanded into a variety of venues. An extra special treat was the plenary session with Sam Kean, the author of “The Disappearing Spoon” and other chemistry related books and articles. Having read several of his books, it was fascinating being able to listen first-hand to his method and process of obtaining the material and researching the scientific background for his books. It was an engaging presentation. I would like to sincerely thank the Sacramento Section of the ACS for providing me with this amazing opportunity to attend the 2018 BCCE conference. It served to provide me with countless new ideas and techniques that I could take back and incorporate into my chemistry classroom. I would have to say that this was the most informative and helpful conference I have ever attended! There were so many options to choose from, it was extremely difficult to choose what to attend. If you have the opportunity, I would highly recommend educators at any level to attend the 2020 BCCE that will be held at Oregon State University. Thank You, again, for sponsoring me to attend the 2018 BCCE.